Give Dad a New 'Baby' For Father's Day! If you have a father who loves to cook outdoors and who has really gone the extra mile for you over the years, why not buy him much more than a pinny this Father’s Day, to show him that his exceptional kindness or help has not been forgotten? Rather taking to the controls of a barbecue and serving a menu now a little boring and predictable, he could get a whole new lease of life as a pizza cook – and he doesn’t even have to make the dough! 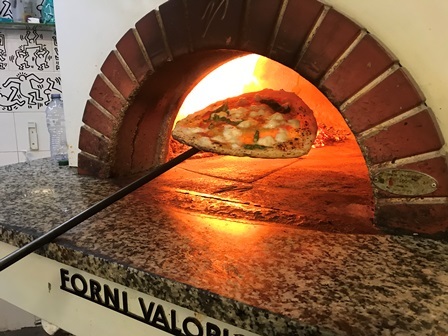 With a Valoriani ‘Fornino’ baby wood-fired oven purchase, you could buy him something that provides years of pleasure, with the lifespan of a Valoriani being 15-20 years, or more. Learning how to build a fire inside the oven, and keep it fed, is something most dads absolutely relish, whilst concocting different flavours through toppings will really keep him on his toes, as the touch of the Mediterranean spreads across the patio. Whilst he could also de-stress in the kitchen beforehand by making his own dough, bought-in dough balls are easy-to-use and the hand-stretching of those can be just as relaxing and dramatic, if dad is putting on a show for the guests. With a good tomato sauce recipe, like that recommended by Valoriani’s Andrew Manciocchi, all he need do is spread that over the pizza base – or leave it off, if preferring to make a white pizza. Any children in the family can then play their part, adding toppings to the base, under your dad’s careful tutelage. It all makes for great family fun and who doesn’t love pizza? Upgrading dad’s summer entertaining will bring not just a smile to his face, but also provide a whole new world for him to explore, as he seeks out new recipes and inspiration. Many different dishes can be cooked superbly in a Valoriani wood oven, from slow roasted pork, roast vegetables and jacket potatoes, to seabass, ‘Lentils Nonna’ and even bread and butter pudding! And, if you want a few barbecue-style food items, you can buy the optional Tuscan grill, to sit inside the oven. The Fornino comes in two sizes, but you would probably want to start dad off with the adorable smaller baby Fornino 60, which cooks one 30cm pizza at a time, in just a few minutes. It has a wheeled stand and gorgeous dome, coloured cream, red or black, or a customised colour/design, if you prefer. And, if you’re not sure dad would enjoy being a firestarter and manager of the flames, you can choose a gas-fired Fornino instead. Valoriani are Italy’s finest wood-fired ovens and the Forninos have a 3cm refractory clay dome under their coloured top, a 3cm refractory clay floor, and insulation top and bottom – great for safety but also heat retention. This oven goes from cold to 300°C in 30 minutes and will stay warm overnight, ready to cook breakfast! Weatherproof and with stainless steel flue and rain-cap, there are no worries about British weather affecting these beauties. Getting dad this superb treat, as a special thank you for whatever he has done for you over the years, will be a lasting reminder of your gratitude and a present that should make him the most popular garden party host in the neighbourhood. But, if he’s a DIY dad, you may prefer to give him a few hours of fun, by buying him a Valoriani kit that will allow him to build a bigger oven of his own, as a self-build project in his outdoor space. With this, he can build both the oven floor and housing himself or ask a builder to do that for him. Alternatively, the Valoriani UK team can be hired to assist with this. If dad wishes to go it alone, he will get full instructions from Valoriani and telephone support too. This could allow your dad to add value to his property, by having a new oven feature in the garden, with the same high-quality Valoriani standards. The wood-fired Fornino 60 costs £1995 and a Valoriani DIY kit costs around £1000. Details of how to order can be found at www.valorianiuk.com or by calling 01772 2500000.